Bhardwaj	SK, Sharma	AK, Pandey	RK. 2012. Effect of melatonin and prolactin on photoperiodic induction in body mass, testicular growth and feather regeneration in Indian weaver bird. Biological Rhythm Research online. Abstract. We demonstrated the effect of exogenous melatonin and prolactin on photoperiodic induction in the Indian weaverbird. Birds (n = 5 per group) were exposed to natural (NDL) and long day length (14 h light: 10 h darkness, 14L:10D; LDL) and for about three weeks, beginning at the end of March. In each light condition, birds received daily at ZT 10 melatonin and prolactin (group 1) or prolactin alone (group 2) at a dose of 20 Âµg/200 Âµl/bird/day; group 1 birds were administered with melatonin 0.5 h prior to prolactin. A group (group 3) on both light conditions received a same volume of vehicle; this served as control for the treatment effects. Subcutaneous injections were given for the first 10 (NDL) or 13 days (LDL), and thereafter left un-injected for the remaining days under the photoperiodic conditions. In birds on NDL, body mass did not show the effect of treatment but significantly varied as the function of time. However, body mass of birds on LDL did show significant variation during the experiment. Testes were stimulated in groups 1 and 3 on LDL, and only in group 1 on NDL. Feather regeneration was faster in groups 1 and 3 on NDL, and in group 2 on LDL. Interestingly, groups 1 and 3 had similar rates of feather regeneration. These results show that birds on NDL responded differently than birds on LDL, and that prolactin-induced suppression is reversed by the prior treatment with melatonin. It seems that melatonin possibly plays an indirect role in regulation of seasonality in photoperiodic bird species. Adult male Baya Weavers (Ploceus philippinus) were obtained in March 2010 near Meerut in northern India (29 01 N; 77 45 E; day length about 12 h, sunrise to sunset). They were acclimatized to captive conditions for two weeks and then brought indoors and maintained on short days length (8L:16D) until ready for the experiments. 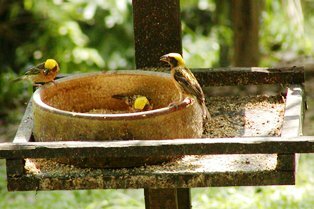 Photo (left): male Baya Weavers at feeding table.